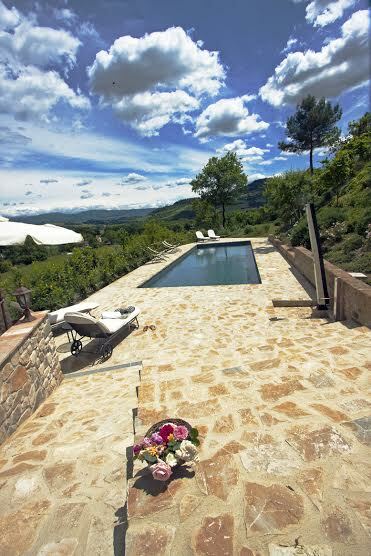 Just 5 minutes drive from the medieval centre of magnificent Todi, along lanes of vineyards and olive groves and rising gently uphill, over looking the Tiber valley, is a wonderful enchanting hamlet with its own tiny 13th century chapel. 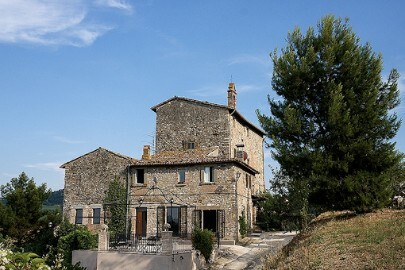 Once the summer residence of a local noble family, the borgo dates back to the 16th century and is the ideal location for a perfect, relaxing and authentic long or short term vacation in Umbria and has Todi in its sight just minutes away with all amenities that the majestic town can offer. The beautiful country house has been converted into 3 beautiful guest apartments, each one having its own distinctive character. 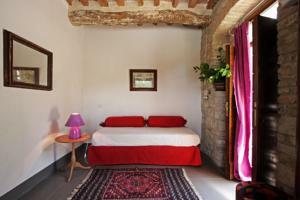 The apartments are spacious, bright, romantic and elegant with a great attention to detail to preserve its history. It was meticulously restored in 2010, in strict accordance with the previous alterations over the centuries to preserve the marks of the passage of time and without doubt absolutely captures the spirit of the place - magical. There is a large terrace with a panoramic view and perfect for sunbathing or just relaxing and ideal for a summer evening dinner party. 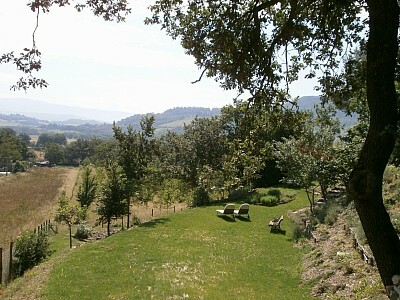 The lovely terraced garden with its aromatic herbs and old roses give it a distinctive old world charm. 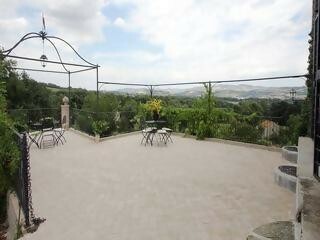 New for 2014 is the inclusion of a beautiful panoramic pool with views over Todi. There is also a wellness room with spa jacuzzi which guests have at their disposal. There is a ground floor lodge and patio. 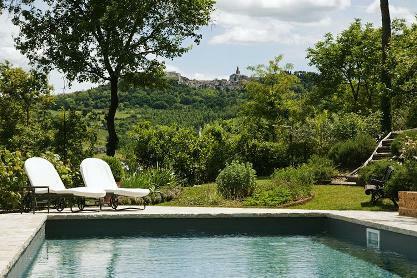 The country house is an ideal location for a family or group vacation, anniversaries or small meetings! The vaulted lodge originally used for making wine is restored to a common lounge or ideal location for extra space, reading, listening to music or even workijng ! 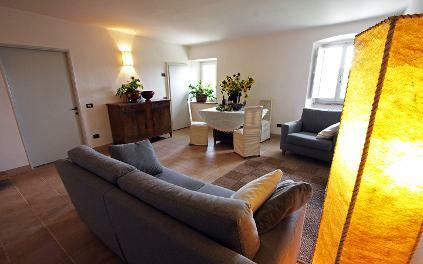 The three guest apartments are extremely comfortable and conceived so that guests immediately feel at home. “Domus Picta“ and ”Angelus Novus“ are composed respectively of double bedroom, sitting room with sofa beds, kitchen or kitchenette and bathroom, and can sleep each two to four persons, whilst “Ariel” can accommodate up to six people. . All have comfortable beds and sofa beds, designed with passion. Furniture is both traditional and classic. 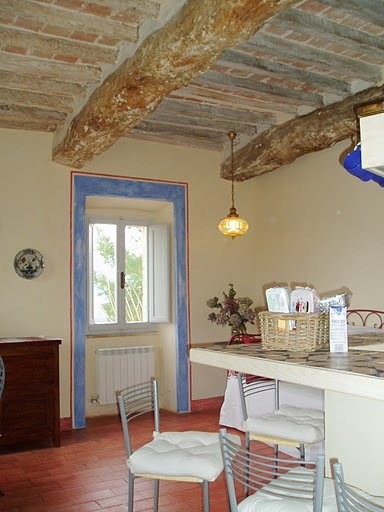 In this beautiful romantic apartment, the restored stone mouldings from the original construction, as well as the remaining traces of the murals can be clearly found, The original materials, such as the pavements and beams have been recovered and combine harmoniously with furnishings made skilfully by local artisans. The apartment is composed of a cosy entrance, a large and panoramic living room with kitchenette and a sofa bed with two separate places, a double bedroom and a bathroom where a round wall niche adorned in white mosaic tiles, contains a relaxing shower. The spectacular terrace facing the entrance is an ideal place for resting the body and mind and for dining in the cool air of the evening. The impressive antique beams blend harmoniously with the elegant floor made of large grey slabs. 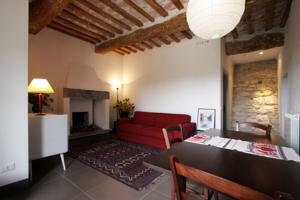 In this apartment, modernity combines well with the medieval tower’s stone walls facing sideways the living room. 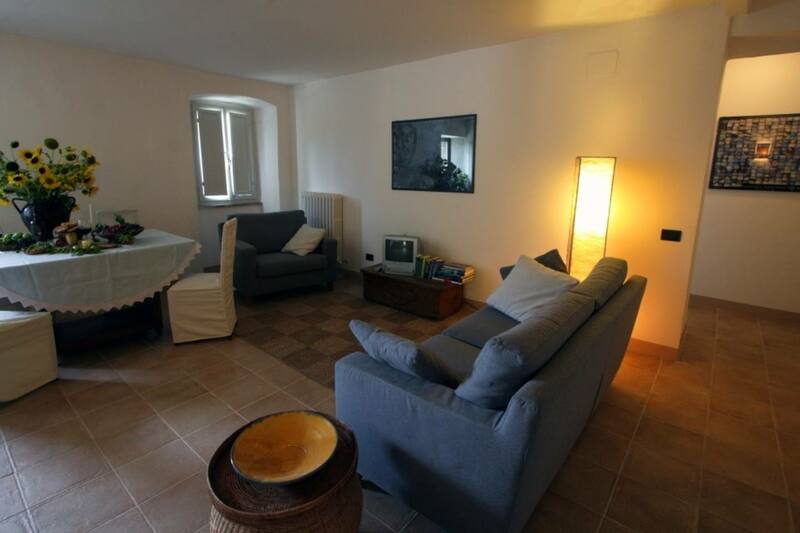 The apartment, accessible to handicapped people, is composed of a living room with fireplace and furnished witha a comfortable sofa bed for two persons as well as of a room with two twin beds that can be joined; both rooms leading to a panoramic terrace. A kitchen and a bathroom of a minimalist modern desifn complete the layout of the apartment. 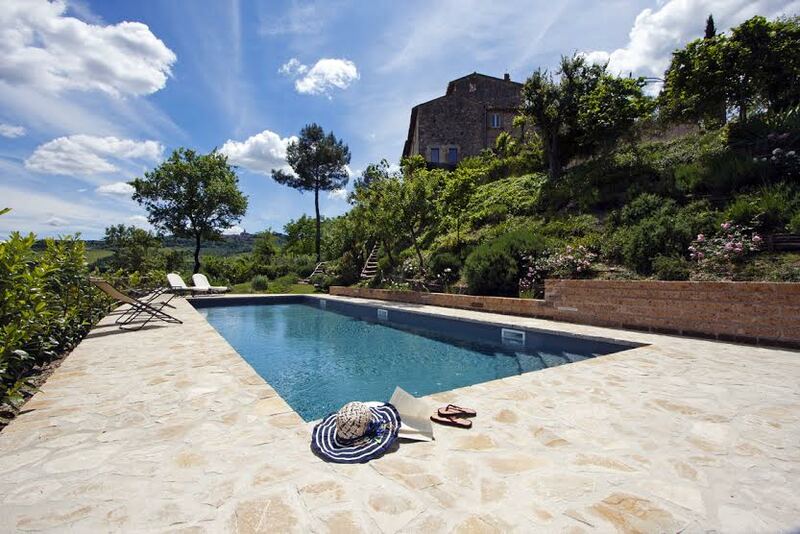 Ariel is the largest apartment, situated on the highest floor of the building and from which one can enjoy the splendid panorama of Todi as well as the countryside at the opposite end. The apartment is composed of a large living room with a dining corner, sofas and TV, and two spacious bedrooms, furnished respectively with a double bed and two twin beds. 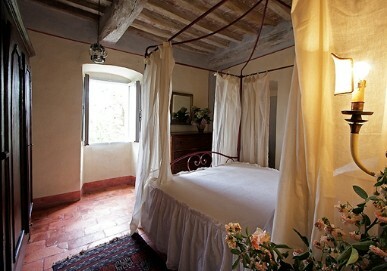 An additional french bed can be provided if necessary. 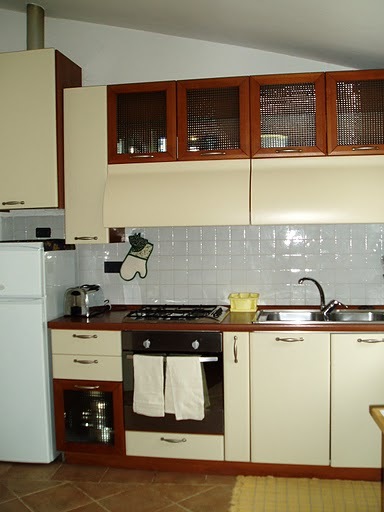 The spacious kitchen, which faces the hill, contains a fridge with freezer and an electric oven. By the fireside, there is a commodious table for breakfast or lunch. In the bathroom, made of stone walls, a tall mirror reflects the oak trees bordering the street and the hills beyond them.